This enchanting 5-star hotel located in the heart of Abu Dhabi offers luxury on tap. 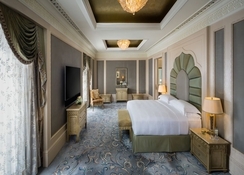 Emirates Palace certainly lives up to its name, its grandiose exterior matched by an opulent interior, with state-of-the-art furnishings, contemporary décor and gorgeous landscaped gardens. The hotel features 394 stylish rooms and suites, complete with first-class amenities and luxury bedding to ensure a comfortable stay for all hotel guests. 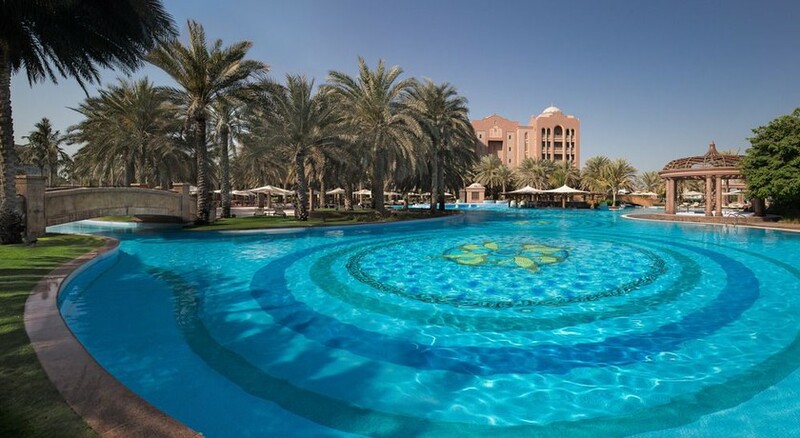 Spend time in the two swimming pools, tap into the wellness scene with yoga classes, jogging and cycling trails and sport facilities available, or unwind at the Emirates Palace Spa with indulgent packages and treatments that aim to pamper. Guests will also experience an intimate setting thanks to the hotel's private stretch of beach and marina, perfect for strolling at sun set. Emirates Palace features fresh, innovative cuisine across its nine chic restaurants, plus three comfortable bars that cater to every occasion. 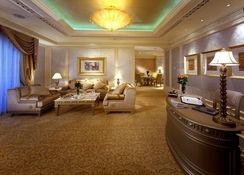 The hotel also provides special features, including a high tea experience, plus occasional topical events and parties. Outside of the resort there are plenty of attractions to suit the whole family, including camel rides along the glittering beach, watersports, IMG Worlds of Adventure and more. 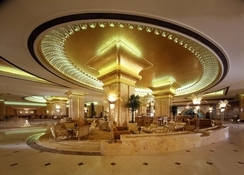 The Emirates Palace Hotel is a 30-minute drive from the Abu Dhabi International Airport. Situated on the West Corniche Road, this lavish hotel is nestled among an array of tourist venues and attractions, including high-end shopping malls, restaurants, the Marina Mall, cultural institutions and the Heritage Village. 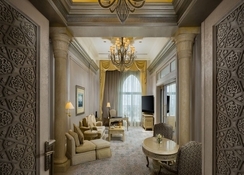 The 394 rooms and suites at Emirates Palace are categorised as Coral, Pearl and Diamond rooms. All rooms come with a 24-hour butler service, a balcony or terrace with spectacular views, air-conditioning, in-room multimedia & entertainment systems which include a personal iPad control, flat screen TV, free Wi-Fi, safe, minibar, and a safe. Some rooms include workstations and connecting doors to other rooms. All rooms allow for a baby cot, and all bathrooms feature an oversized bathtub. 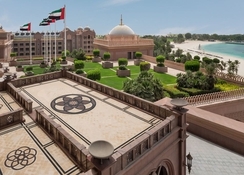 The Emirates Palace is palatial in every sense, with no less than 14 restaurants, lounges, cafés, and bars serving some of the world’s finest cuisines. Le Vendome offers all-day dining serving up international cuisines, Mezzaluna offers delicious Italian dishes, Sayad serves sensational fresh seafood, Mezlai Emirati Restaurant boasts an authentic Arabian menu and Hakkasan's award-winning plates make for a popular dinner venue – to name a few. The hotel's culinary highlights change, with new brunch menu's, signature dishes and favourite cocktail's – so keep your eyes peeled! At the Emirates Palace recreational amenities include a steam room, a sauna, a relaxation room, a spa, massages and a sun terrace. Activities such as badminton, a game room, billiards and table tennis are offered at the hotel. Guests who wish to be active on holiday can enjoy activities such as football, basketball, exercise in the fitness room, volleyball and tennis. Watersports such as jet skiing and water skiing are available at the beach by local providers. There is also a Palace Kids Camp available throughout the summer for fun-loving family holidays. City/Tourist tax is payable locally. West Pool Closure: From 22 June 2018 until 04 July 2018, our West Wing Pool and Cascades pool side restaurant will be closed for annual maintenance. The East Wing Pool will be available to guests along with our Camel Tent and all water sport facilities. East Pool Closure: From 24 July 2018 until 22 August 2018, our East Wing Pool and Las Brisas pool side restaurant will be closed for annual maintenance. The West Wing Pool, Kids Club, Camel Tent and all water sport activities will be unaffected and will be available to guests. BBQ Al Qasr Closed from 13 May 2018 until 4 October 2018. Le Café Terrace Closed from 13 May 2018 until 4 October 2018. Sayad Closed from 7 May 2018 until 14 June 2018. Mezlai Closed from 17 May 2018 until 14 June 2018. Le Café Closed from 27 May 2018 until 4 June 2018. Mezzaluna Closed from 6 July 2018 until 22 July 2018. Havana Club Closed from 21 July 2018 until 31 July 2018.